Posted on 30th September 2013 at 14:52. Google, has released a new search algorithm in the week of its 15th Birthday, this system sorts through all the information it has when you search and come back with an answer. However google actually started using this a month ago, but only announced the change today. Let’s start by defining an algorithm- this a bit like a sieve that google uses to sift through all the information on the billions of pages in the web to find what it believes to be what you are looking for. 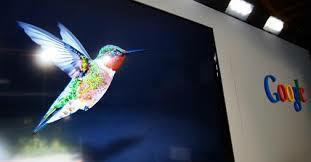 Hummingbird is simply the name given to the new algorithm, which is designed to help give better results. It is named so as it is precise and fast, just like the tiny bird. How relevant the links are on the page. Does believe and trust the page. The content and use of text. What does it actually mean to the user? Basically it’s like having a classic vintage car, with a great engine but not with today’s mod cons, the humming bird is like replacing this engine with an all singing and dancing modern engine, but we didn’t know, didn’t look any different so we didn’t notice the difference but its performance is sharper and cleaner, quicker and clever! Google says “In general, Hummingbird is a new engine built on both existing and new parts, organised in a way to especially serve the search demands of today, rather than one created for the needs of ten years ago, with the technologies back then”. The hummingbird has a more empathic approach; it engages with the sentence,not just the keyword. And technically thinks about the meanings behind the words you search. Google has previously used conversational search using knowledge graph answers; Hummingbird is intended to apply “meaning” technology across the web when searching the billions of pages, it is hoped it will bring better results. Unfortunately as yet there is no way of determining if it works as there is no before and after comparatives. We just have to take Google’s word for it. Do we need to ask ourselves is SEO dead? SEO is still alive and kicking, in fact,google say that nothing is new or different, so publishers have nothing to worry about. The same advice still stand high quality content, high quality links, building trust. Not necessarily though, if you did lose traffic! It may have been due to the hummingbird, however Google stated that “it could also be due to some of the other parts of its algorithm, which are always being changed, tweaked or improved. There’s no way to know”. Call us on 0161 669 5544. Look What’s Ahead, Part 2.For The Best Search Results, Optimise For The Local Market.